Silpancho. Looks like roadkill, but tastes a fair bit better. Healthy too. You'd have to eat at least 3 in a row before you died from cardiac arrest. See what I did with the title there? Comedic Genius. And that’s probably the last french reference you’ll see on this site. Ever. Even though the French have given the world so much, like the invention of arrogance and their ironic obsession with eating small slimy creatures that really belong under logs. 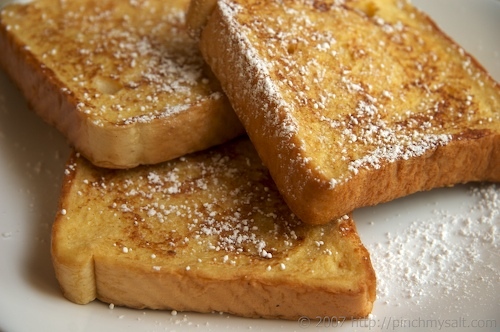 I guess I could concede French Toast, but I think historical evidence and a western obesity epidemic will clearly point to this being an American invention. However! This article is about Bolivian Food, so that’s the last of it. I want to be clear: Bolivia has the best steak in the whole world, and it’s still probably cheaper than whatever boot leather your local supermarket is flogging. Yes, it’s better than the steak your mom cooks. Yes, it’s even better than the $150 steak weighing 50g that you got at that glitzy restaurant. And about 80 times bigger. The Best. Glad we cleared that up. Aside from steak, Bolivia’s other dishes are pretty heavy on the palette too. Let’s be honest, they’re not a nation of health freaks and fitness fanatics. They like their food tasty & interesting. Fitness activities like jogging are hindered somewhat by rabid dogs and a severe lack of road rules. And a severe lack of motivation, on my part. But the food is absolutely incredible. Most of it is based on meat, rice and potatoes, so you’ve got to work it down. Sometimes you could lose weight just through chewing. If you’re a kid and you hate vegetables, Bolivia is the place to be. They exist, but once mum sees them getting washed in the gutter at the market, watch how fast your menu changes. We had to soak all our fruit and vegetables in iodine for hours, which killed anything living on them, and had the added benefit of keeping your thyroid on track. My brother also glowed in the dark for a little while after every meal. I went through a banana phase at one point. Maybe I was low on potassium or something, but I ate about 4 a day, at least 2 on my cereal, plus banana-flavoured Brazilian Quik and candy chews and gum. Weird, ’cause none of those things have potassium. We brought a whole bunch of fresh bananas back on the roof of our bus after a jungle trip one summer. We ended up with about 6 left. It was fun watching them drop of the back the entire time. Probably should have mentioned it to one of the adults. Silpancho (see pic above.) Flattened mince and bread crumbs. I guess like a giant meat pancake. Fried in oil. You don’t ask what kind of oil it is. 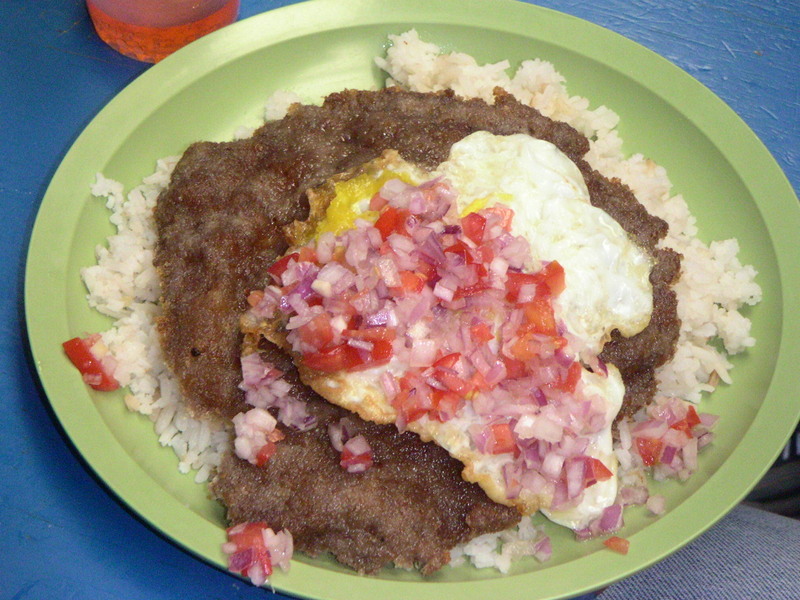 Serve on a bed of rice with a fried egg. Garnish with a tomato/onion salsa. Marvelous. Usually a potato or two thrown in as well. South America is like the birthplace of potatoes. Bolivia has about 36 types, most of which taste like chicken potato. Pique Macho. It’s called Macho because it’s so big, if you can’t finish it you’re a sissy girl. I came close one day, before my spleen exploded, making me look like my ribs had the gout. Served on a pile of fries, Pique is an even bigger pile of steak cubes and chopped-up hotdog. Add onion, tomato chunks and pieces of hot peppers. Watch the hot peppers. Sometimes, if you’re an idiot, you can confuse them with normal peppers and shove them in whole. Crying in front of your family like a 4yr old and scratching your tongue with a fork to get the taste out. I would never do that. There’s a mini version of Pique Macho that’s just called pique. It’s only hotdog chunks and fries. Not as awe-inspiring. I tried cooking Pique Macho once over here in oz, but it sucked pretty hard. Kudos to the Bolivian chefs that kept us well-fed all those years. Surubí. Note the guy in the background cutting it up with a hacksaw. You can take your girly salmon somewhere else. Surubí. That may be spelt wrong. It doesn’t matter. 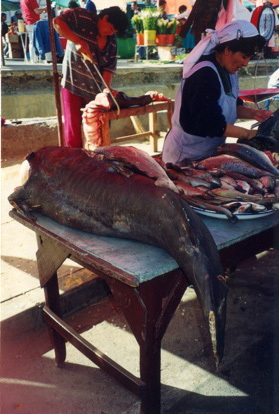 All you need to know is that Bolivia has big freshwater fish. Big enough to cut with a hacksaw and serve as fish steaks. Big. That’s just how we roll. Anticucho. These are cow heart skewers with a small potato plunked on the end and dowsed in peanut sauce. Some say they’re the greatest culinary invention since the spoon, or red M&M’s. They’re cooked by street vendors late at night on little grills. They may use diesel as the fuel. Perhaps turpentine. At any rate, Anticucho are moorish. You start with one and end up eating about seventeen, collapsing on the ground in digestive rapture, only to be mugged and have your clothes stolen. The greatest part (and this is true) is that they use old bike spokes for the skewers. Priceless. Salteñas. Salteñas are probably the most famous/beloved Bolivian food. I was never real big on them. Hard little pastries chock full of all kinds of junk. Chicken, meat, olives with their pips still inside, peas, potato, onion, boiled quail egg, you name it. It’s like a portable casserole. Would be perfect, except they’ve also got juice inside, which is usually 240ºC and explodes onto your chin without fail on the first bite. Pastéles. I think that’s just the spanish word for pastries, but they were these awesome hollow things with a layer of cheese on the inside and they’d expand like balloons when fried in oil. They put icing sugar on the outside that actually went really well with the cheesey insides. They are served with a purple corn drink called Api that went well with nothing and tasted like you were drinking hot dirt juice. But it came free as part of the deal so you didn’t complain. I always gave mine to dad, who promptly passed it to my brother, along with some story about ‘engaging’ in the culture. Those are some of my favourite Bolivian foods. You can search for all these dishes and more online. But if you’ve ever experienced Bolivian Cuisine, add some of your faves in the comments. Posted in Bolivia, FoodTagged bolivian, cuisine, Food, french toast, Pique Macho, recipes, saltena, silpancho, SurubiBookmark the permalink. Well done Ardin, you single handedly have successfully managed to convince me that I don’t ever want to travel to Bolivia!! Thanks Cordell. I’ll have to let the mobile plugin guys know I guess, I don’t have any way of testing it really. No, do it Miriam! You’ll love it! You’ll have to write another blog to change my mind! !